So, I had a custom thread a long, LONG time ago - half a dozen years or so. But I figured since I'm getting in with Valhalla Customs, have a lot more playtesting and design experience, am buying miniatures, and all that... I thought I'd get my customs together and maybe, ideally, eventually aim for an SoV nomination! So let's see what I've got! 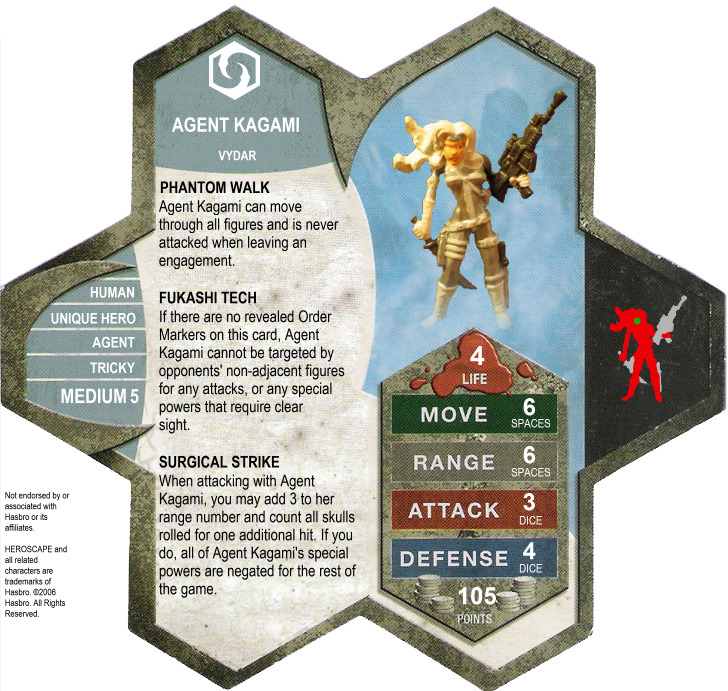 The oft-ignored genre of cyberpunk lends itself well to Heroscape's tradition of sci-fi spies and agents, so introducing Agent Kagami, inspired by the classic Ghost in the Shell series of films, comics, and more! Her cloaking technology allows her to sneak past enemy lines easily, though her cover is blown if she's not careful; the goal is to get into position for her Surgical Strike and blow an important figure away in one hit. Once she's taken her shot, though, her suit will power down and leave her defenseless... so you'd better not miss! These figures were begging for the squad treatment, so drawing on Napoleonic history, the burgeoning flavor in steampunk Arctorus, and shows like Sym-Bionic Titan, the Aegis Herred Officers were born! It should be pretty straightforward how they work - you set up some units, split up your Officers, and hold onto that Tactician boost for as long as possible. As long as you have men to protect them they should be mostly safe from range, and they have reasonable defense to help them out. In ancient Greece, men became heroes and heroes became myth, and in his day none were more mythic than Alkeides. While brutish, dull, and more than slightly arrogant, he nonetheless could turn a sea of men into a sea of bodies. He claimed to be of divine birth, armed with the strength of the gods, and ultimately immortal - and, when he was torn from history to the battlefields of Valhalla, only the myths remained. When he arrived, Einar put the would-be demigod to good use. Forsaking any enchanted gifts of weapon or armor, finally Alkeides accepted the Crest of Atli, giving him the godlike strength he'd always claimed. With it, he may well tear Valhalla asunder - so long as he remembers that even "gods" are mortal. 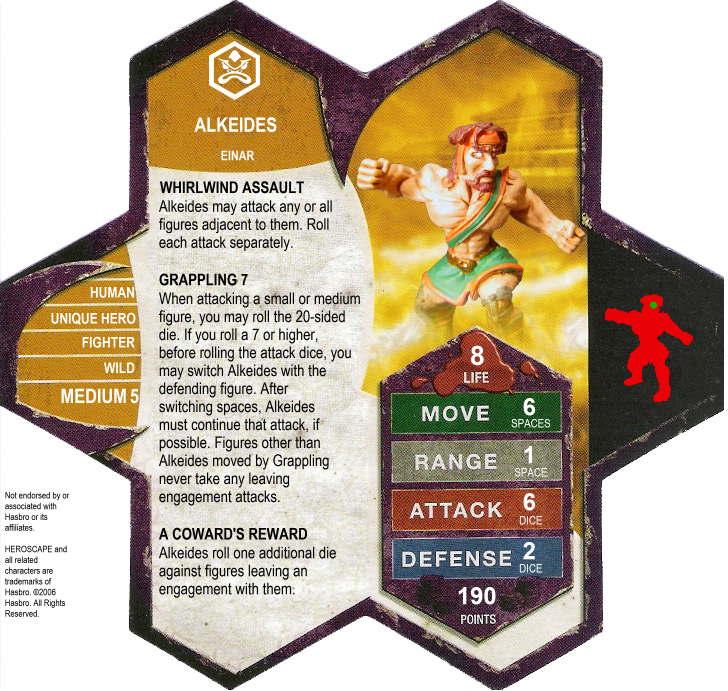 After seeing a few old-school Hercules flicks, I felt compelled to bring the old-school hero to Heroscape boards. Tanned, bearded, and muscular brawlers are a type of hero long forgotten! Whirldwind Assault is pretty self-explanatory, but when combined with Grappling it lets Alk weave his way through squads and chain a TON of attacks in the right situation - it'll definitely encourage enemies to spread themselves out, though, but even then it can help him grab the high ground if necessary. It SHOULD work the way I want it to, but I'm not 100% on how the powers interact. A Coward's Reward is there to keep baddies from fleeing his threat range and is a nice flavor touch. He bonds with the Dreadguls, which is a pretty fitting combination, I think, and shouldn't be a broken one. Price is definitely up for discussion. Same as the Mermaid, I made a point of getting my hands on this upcoming giant skeleton from DCM! Only in this case, rather than getting just one, I'm getting five... so naturally, I wanted a multiple-based system. When thinking of powers for these guys, Cleave seemed like an obvious mechanical choice - it seemed to fit the sculpt and helps give squad control. But I wanted something that would encourage playing them in pairs - since I'll be getting them in two different colors, Kickstarter Green and Basic Red, it should be easy to track which Uncommon is which if you play them two at a time. This power PROBABLY encourages playing even more than that... but should work pretty well with a duo, I think. 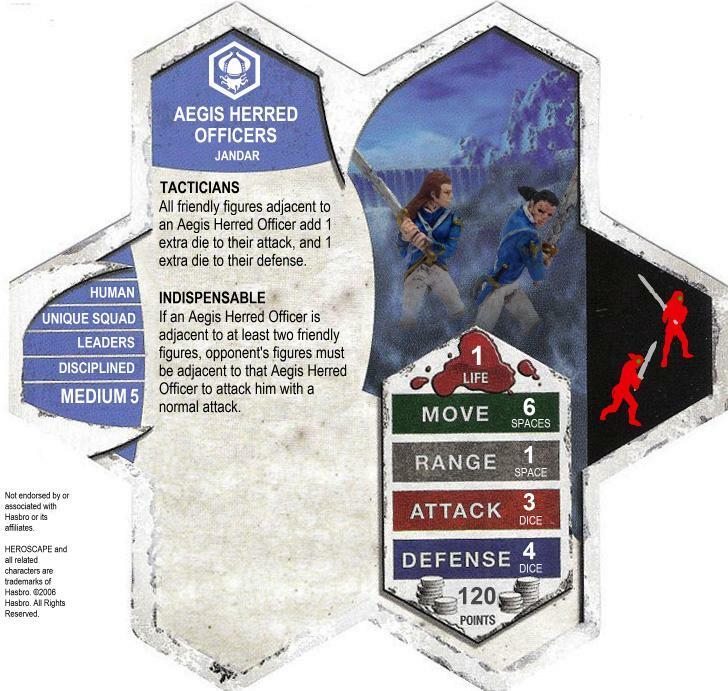 Essentially, you can move them up together, and when they're in the fray, get two attacks per Order Marker - and potentially kill up to four squaddies with some luck. On top of that they've got some solid stats and help further expand my undead hordes! This one uses a figure that's not even out yet, as should be self-evident! Having put down my money for the DCM Kickstarter, I felt the need to get the ball rolling on some units that actually use them... they won't ship until November, which gives me more than enough time to get things straightened out. The trouble with a mermaid is that they're by nature water-based - they need to be largely terrain based. But if Heroscape has shown us anything, it's that terrain-based units are HARD to manage... so I knew she'd need some way to bring the battle to her enemy. With her trident and arm raised, she seems to have some magic to her, so I can easily picture her as an aquamancer. 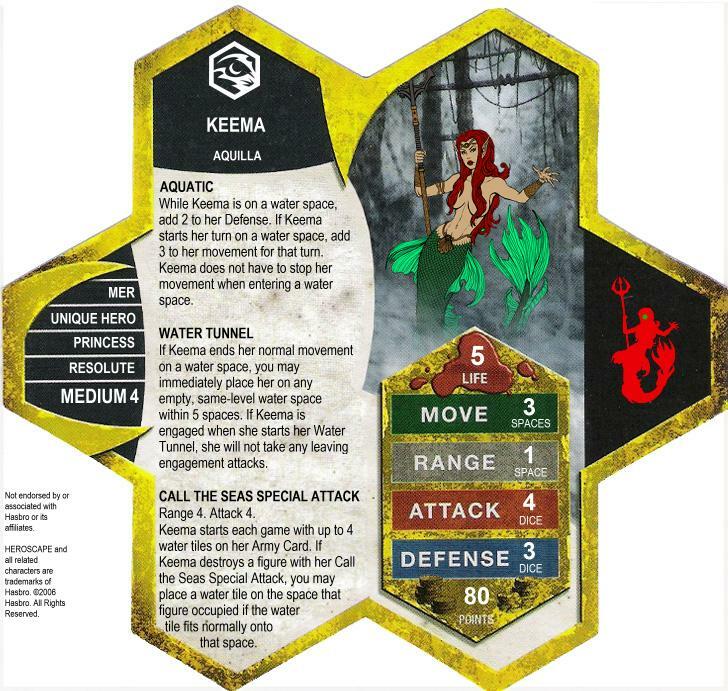 Call the Seas lets her spread some water tiles around, Water Tunnel lets her hop from space to space, and Aquatic (essentially a souped-up Amphibious off of the Sahuagin Raider) gives her a boost when she's camping in her puddles and some solid mobility on a more water-based map. She's terrain-dependent, but if the map's not in her favor? Well, she can make it in her favor. Toma Maat is one I'm not 100% set on... I love the figure, and like theme behind it. I picture him as being from Grut, and the outfit is sort of vaguely native South American in style. So giving him some weird cross-planet synergy with the Mohicans. I think he's a good alternative to Brave Arrow in that he'd provide ranged support. But he's weaker, doesn't provide any direct boosts... I think Swamp Camoflague (loosely lifted from the Glacier Camoflague) might make him too terrain-dependent, so I wouldn't mind swapping that. I think Stealth Leap should provide ease of height, War Cry should net him quite a few activations... he might end up being a bit overpriced, but maybe I'm underestimating him and Swamp Camoflague. Not as many seem to be out in the wild as I'd hoped... but they're on sale from Paizo's site, and he's common, and it's still in print. So he shouldn't be too hard to find. This one is more of a top-down theme unit. I saw the figure on sale on Miniature Market and was inspired... the Cogs seem to be still widely on sale, but I think they make for a great "construction" vibe to them. This one in particular was evocative of the classic powerlifter from Aliens. So, that's the theme here - it's a guy in power armor, slow but steady. His special attack is sort of a combination of the "Armor Piercing" mechanic from C3G and the Rapid Fire Special Attack. I think it combined the industrial feel with the heavy weapons look. Pilot's Cockpit is the secondary, more thematic addition - the essential theme is, when he's hit, it's a 50/50 shot that you'll damage the guy or damage the armor. If you just hurt the armor, the suit'll malfunction, but he'll still survive. I think the mechanic would make for a good balance with his general slowness and short range, because he's gonna get POUNDED from afar. I suspect this guy's availability is pretty low, but he seems pretty unpopular, so you'll probably find him. Last edited by johnny139; November 8th, 2014 at 07:09 PM. Re: johnny139's Classic Custom Thread! My first impression was that Toma Maat might be overpriced, but perhaps not. While his range is not massive, with stealth leap it could put a number of opposing figures in his threat range in the right conditions. It's not flying and range, but it's the next best thing. I think the first sentence of Pilots Cockpit might need to read "If Lt Scott Weaver would receive only one wound from a normal attack and has at least one unrevealed order marker, ..."
As is, it is possible to put him in favourable position such as a chokepoint or on a glyph, and then never put an order marker on him again. That said, he is worth a lot of points to be a doorstop. And it is only half the time, so maybe I'm overexaggerating. I don't like abilities that may actively discourage you to use a unit, but that is just personal preference. That's a good suggestion, actually - I hadn't considered the "camping" approach, and it's definitely something to be avoided here. I don't think it would make much of a balance issue, but it's to be discouraged either way. And thematically I can handwave it pretty well. New custom! Bring on the Mermaid! Placeholder image, obviously, until some shots of the painted versions come in... or the miniature itself is released. I'll probably be choosing the Kickstarter Paint version, so that'll likely end up on the final card. I wanted a terrain-unit with utility, so I drew pretty heavily from Mika Connour, who gets bonuses from terrain and can shape the battlefield herself. Hopefully I'll play around with her a bit today... see how she feels. I like your ambition Johnny! I am hoping that Pathfinder will also release a mermaid miniature with their Skulls & Shackles set. If so then I am planning to make a squad. If not then I'll make a common/uncommon hero of her, anyway on to your design. Working left to right, I would prefer Merfolk to Mer as species. Unique Hero is required for a named unit. Resolute works for the personality. Medium is right though she might be closer to 5. I guess we won't know for sure until November. Keema is a fine name. Aquilla makes sense for the allegiance since she already has the Water Elemental. Aquatic and Water Tunnel are great. Call the Seas SA borrows enough from Mika Connor's Blend Into Shadows. There may be a potential corner case here, but I can't think of one off the top of my head though. Statwise, 5 Life and 4 Attack might be too much for a mergirl. 3 Move, 1 Range, and 3 defense are right on. 80 points is right on for what you have, but if you drop her Life and Attack by one then I think she would fit at 70 points. I like her but hopefully Pathfinder will give us another sculpt to work with. I would prefer to design squads than heroes especially unique heroes. Nice design, johnny. Call the Seas is perfect and can help out some water-dependant units or even the Vipers by slowing down their opponents (it also helps the GIE, oddly enough). Call The Seas is a nice ability, and I think any concerns I would have are balanced nicely. Having to destroy a figure means you can't just spam a moat near the beginning of the game and even if you do manage to destroy a clump of figures with her you only get 4 tiles to place. 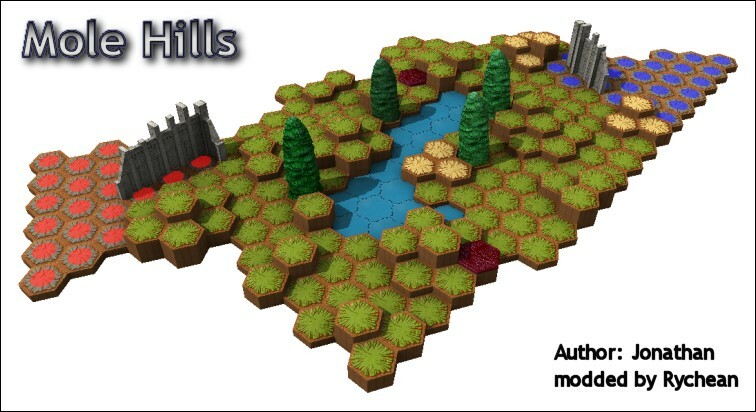 My only concern is if there is a map that this ability might break, but I can't think of how... maybe getting 2 Water tiles adjacent to each other on different heights may close of access to double spaced figures and prevent them from moving. I'd say that would be a really rare case though. I played some more casual games with her yesterday on Mole Hills - her army won both times, but that was more thanks to Q10 and the Krav than anything she did. The first game she went down a bit too easy (a cursed 1 movement roll stymied her getting into the pool), but in the second she was able to utilize her Water Tunnel to get right up in Raelin's face and deal a ton of wounds. Not enough to kill her, but Q10 was able to move next turn and finish her off. She was never really able to get good use out of Call the Seas (destroying a figure and placing a tile, that is), but I may have been playing her too aggressively - shouldn't have gotten out of the water to play with height advantage, particularly since she can avoid leaving engagement attacks with Water Tunnel. To keep her points down I'm considering lowering her Life by one - that sounds like a good call, Super Bogue, as she's pretty much a goner once caught either way. I'd like to keep her Attack as is, though, to only give it some more utility... I mean, that trident looks pretty pointy! I don't think it'd be unprecedented. Thanks for the input, all - she was fun to play basically speaking, so hopefully with some more testing she'll be golden! I wanted a way to use my eventually-will-arrive Firbolg Skeletons - in their two different colors - in a way that encourages pairing them up, which would help keep them straight on the battlefield. So I came up with Warband, which lets Uncommon Heroes work in pairs... I'm afraid I'm missing some major mechanical loophole in my wording, though. I'm too used to C3G's language. Cleave is essentially thematic (I mean LOOK at that sword! ), but also helps give them better squad-eliminating power, which is always something I like to see. Maybe let Warband be used on other Large or Huge Undead Heroes? That leaves some options open. Zombie Hulk Tag Team? I think the wording looks okay. Greygnarl's idea is good and bad at the same time. Very cool custom, johnny. I think you might have overpriced him by 10-30 points. Think about what they would be priced as a 2-figure Unique Squad. In that case Warband would be a pretty prohibitive power for a 230 point 2-figure Unique Squad. *Take a turn with this Unhallowed Titan and one other Unhallowed Titan, during which they cannot attack. 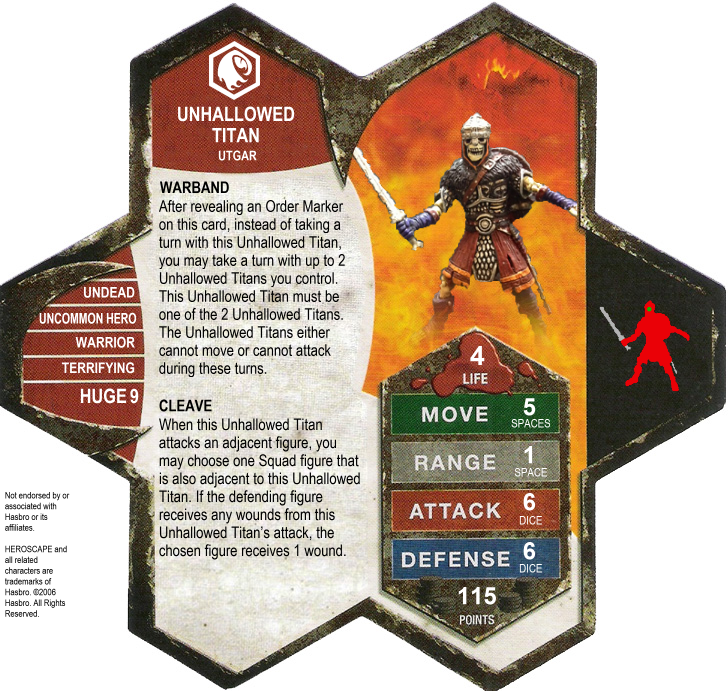 *Take a turn with this Unhallowed Titan and one other Unhallowed Titan, during which they cannot move. Yeah, I think going with the bonding option would probably be the best option... I like the aesthetic of the power text I have right now, but it does interact with turns poorly. As for pricing, I'm aiming more for the point range than the powerset. I'd probably up them to 6 Attack, maybe 4 Life? I'd like to go 115 or 125 (since those are 5-ending unused power points).